"When I talk to most companies, I do think their leaders are pretty short-term focused...It’s pretty difficult to solve big problems in four years. I think it’s probably pretty easy to do it in 20 years. I think our whole system is setup in a way that makes it difficult for leaders of really big companies." "I think it sounds stupid if you have this big company, and you can only do five things. I think it's also not very good for the employees. Because then, you have 30,000 employees and they're all doing the same thing, which isn't very exciting for them. So I think, ideally, the company would scale the number of things it does with the number of people in a linear fashion. As far as I can tell, that never happens. It's logarithmic with the number of people, if that. I would always have this debate actually, with Steve Jobs. He'd be like, 'You guys are doing too much stuff.' And I'd be like, 'Yeah that's true.' And he was right, in some sense. But I think the answer to that...is that if you're doing things that are highly interrelated, then there is some complexity limits. It's all going to escalate to the CEO, because you have things that are interrelated. At some point, they have to get integrated. A lot of our Internet stuff is like that. The user experience needs to make sense. It needs to feel like you're using Google, not that you're using something else. So I think there is a limit on how much we can do there, and we have to think carefully about it. Everything about the automated cars is like - Sergey can do that, and I don't have to talk to him. I like talking to him. But I don't really have to talk to him about that, because there's almost zero impact on the rest of our business. Although it does use some great engineers who we have on mapping and other things. Naturally, they move to that project, but that's a scalable process. I don't have to talk to those engineers. They just move magically. So I do think companies usually try to do very adjacent things. They figure, 'We're going to know exactly how to do something that's very similar to what we already do.' The problem with that is that causes a management burden. Whereas, if you did something a little less related, you can actually handle more things." Only Dead Fish is a blog and digital consultancy run by Neil Perkin. 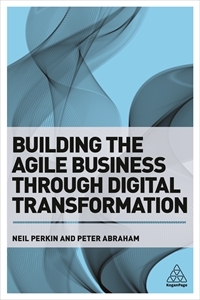 Neil is the author of Building The Agile Business (Kogan Page, April 2017), and the co-creator of the Fraggl Twitter curation app.